Franz Kafka? Anne Rice? Russell Brand? Apocryphal? This statement was attributed to the powerful and singular author Franz Kafka. But I haven’t been able to locate it in Kafka’s writings. Is this ascription accurate? Quote Investigator: Probably not. QI has located no substantive evidence that Franz Kafka said or wrote the passage above. QI believes the actual author was the prominent horror writer Anne Rice whose books about vampires and witches have been very popular. Kafka became a model for me, a continuing inspiration. 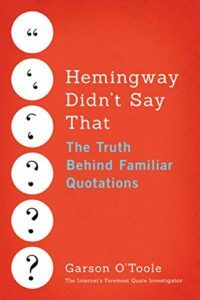 Not only did he exhibit an irrepressible originality—who else would think of things like this!—he seemed to say that only in one’s most personal language can the crucial tales of a writer be told. Don’t bend; don’t water it down; don’t try to make it logical; don’t edit your own soul according to the fashion. Rather, follow your most intense obsessions mercilessly. Only if you do that can you hope to make the reader feel a particle of what you, the writer, have known and feel compelled to share. Anne Rice did not use quotation marks in the passage above because she was not quoting Kafka. She was presenting her perception of the motivating force behind Kafka’s literary works. In fact, QI believes that the philosophy of creativity outlined above is the one that Anne Rice has adopted based on the stimulation she experienced from reading Kafka’s stories. Here are three additional selected citations in chronological order.